La Escuela de Postgrado de Diseño de Harvard (GSD) is pleased to announce the 2019 cycle of the Premio Wheelwright, an open international competition that awards 100,000 USD to a talented early-career architect to support travel-based research. 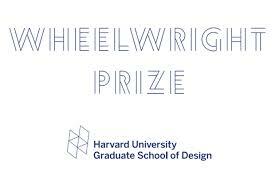 The Wheelwright Prize is open to emerging architects practicing anywhere in the world. The primary eligibility requirement is that applicants must have received a degree from a professionally accredited architecture program in the past 15 years. A los finalistas se les pedirá que viajen al GSD para las presentaciones finalistas en marzo 14, 2019. Finalists must be available to travel to Cambridge, Massachusetts, for finalist presentations on March 14, 2019, at the GSD. A winner will be named in spring 2019.